Amino AcidsTrec Super BCAA System - 300 kaps. TREC SUPER BCAA SYSTEM is a composition of optimum proportions of branched chain amino acids (L-isoleucine, L-leucine and L-valine) enriched with wit. B6 and energizing Taurine in the form of quickly absorbed capsules. Intense training leads to a reduction of branched chain amino acids that build muscle. 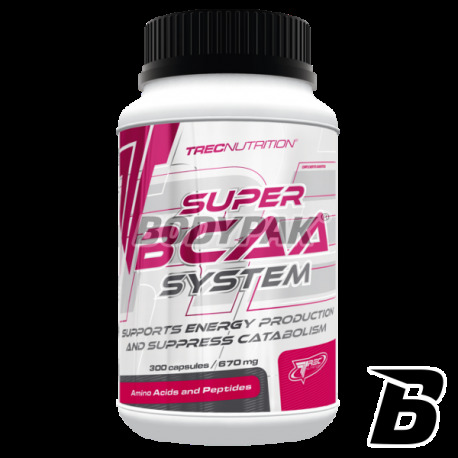 TREC BCAA SUPER SYSTEM helps uzupełniiać BCAA amino acids in your daily diet. TREC SUPER BCAA System is a formula containing optimally balanced proportions of amino acids, which belong to the group of exogenous substances or those whose body can not synthesize. Branched chain amino acids (BCAA) are approx. 40% of lean muscle in the body, thus reducing their level leads to a reduction in muscle tissue. 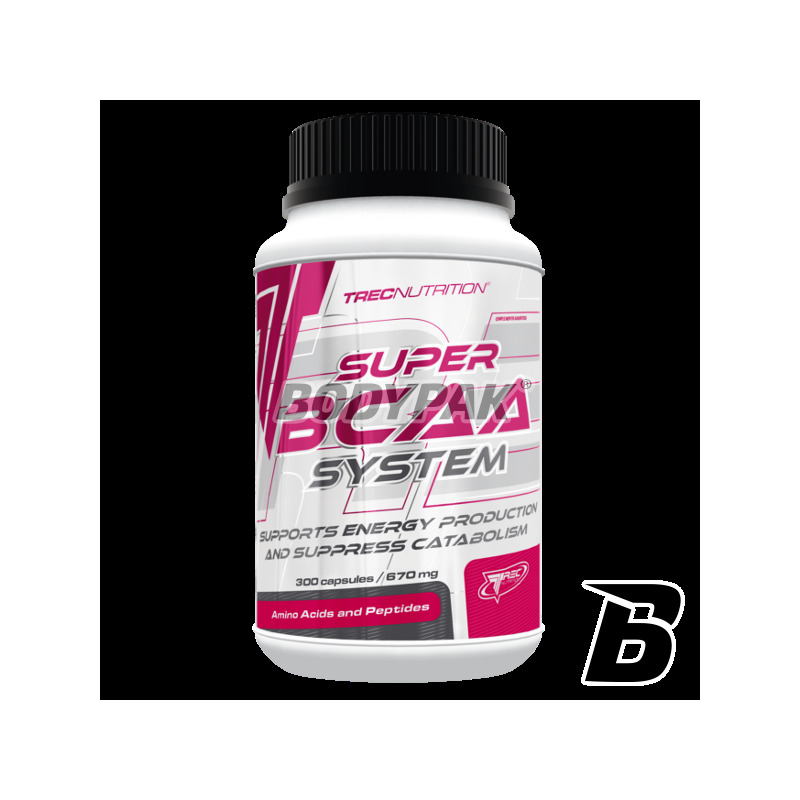 SUPER BCAA SYSTEMzostał enriched with B6, increasing the absorption of amino acids and taurine, which blocks the production of serotonin which increases significantly the strength of exercise. Intense training quickly leads to exhaustion of energy reserves stored in the muscles as glycogen. Another "fuel" for muscles are amino acids (protein molecules that build muscle), especially those with branched chain (BCAA). When the pool of amino acids will not be completed quickly comes to lowering their concentration in the body the effect of which is to reduce the weight of muscle tissue - the effect of catabolic stress. The use of branched chain amino acids before the start of training leading to the reconstruction of the damaged muscle tissue before it has time reduction. Systematic delivery of essential amino acids in the following periods after training, it is essential for proper muscle protein regeneration. Their regular supply is very important to maintain a positive nitrogen balance, which is the state of anabolic (building). TREC BCAA SUPER SYSTEM indirectly on growth hormone (HGH), insulin and insulin, the hormone very strong. Amino acids contained in the TREC BCAA SUPER SYSTEM, and in particular isoleucine significantly inhibit the process of fat storage which positively affects the quality obtained muscles. TREC SUPER BCAA SYSTEM is designed to support physical activity in all sports with a high-intensity workout. However, the increased demand for amino acids primarily occurs in hard training bodybuilders and athletes-training strength sports. TREC BCAA SUPER SYSTEM - POWER anabolism IN THE FORM OF TABLETS! The recommended daily allowance is 10 capsules. Preparation drink about 300 mL of water. 1 capsule per 10 kg body weight 45 min. before training. 2 times a day 1 capsule per 20 kg body weight approx. 30 min. before a meal. Składniki: l-leucyna, l-walina, l-izoleucyna, tauryna, witamina B6 (chlorowodorek pirydoksyny), żelatyna (A)/celuloz (B) - otoczka kapsułki (patrz oznaczenia na opakowaniu). Bardzo dobrze się przyswajają i dobrze chronią moje mięśnie na treningu przed katabolizmem. Natomiast po treningu czuje, że szybciej wracają mi siły - polecam!